This study adds an important dimension to the existing literature on across-region-brides (ARBs). 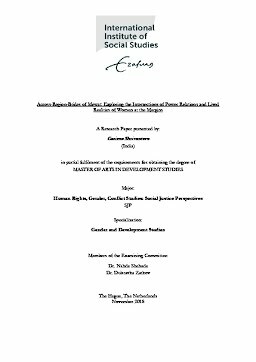 The study applies a rigorous conceptual framework to underpin its analysis of the complex situation and extreme marginalisation of the ARBs; it further uses data collected through interviews with ARBs to bring out the lived realities and experiences of women, which is different from the stereotypical portrayal of ARBs that pervades the literature. The study argues that grave structural inequalities and discrimination have led to situation of extreme oppression of ARBs. It further highlights that the existing literature and media and ngos narratives have fallen short in capturing the intricate and often contradictory position of ARBs. It argues that ARBs are not a homogenous group. Thus, erasing their voices and lived realities from the discourse about them, is a form of epistemic injustice that intensifies their marginalisation. This study uses a cohesive conceptual framework of intersectionality and gender to analyse the social relations of power. I further highlight how intersection of power relations create situation of extreme marginalisation of the community and how the ARBs remain multiply oppressed within this intersection.